In the present day, the challenge for most of the retailers is to ensure a healthy margin by strengthening loyalty and improving customer experience. For revolution in retail industry, the availability of cutting edge tools and the paradigm shift in consumer behavior are the main reasons. By leveraging the powerful ERP solutions, retail companies get cloud support. Without making investments in infrastructure like server, firewall, licensing, anti-virus, etc. retail operations can be managed online using a centralized database. 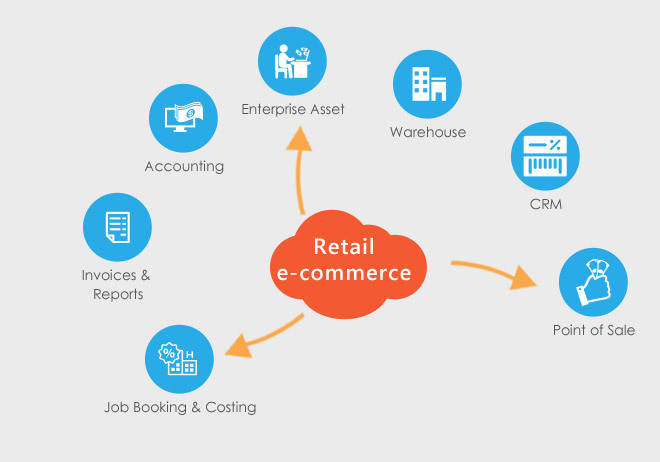 Swash offer cloud based retail management ERP solution. KENMerchant™ to tackle all the challenges faced by the retail industry today. point of sales covers up the most important aspects of inventory management like customer data, finance, store operation and others. The industries which require constant organized maintenance and work process, this solution serves as a constant automated support to streamline the work process and to boost the efficiency. The solution includes managing order, customer data, all product inventory and integrating every sales channel marketplace, online store, and linking with operation, warehouse and suppliers. To get more details about our retail product, please click here. By providing flexible system with all the functionality to deliver an Omni-channel strategy retailers are able to increase sales, enhance operations along reducing costs. Our advanced delivery models and technological process provides an extra edge to the retail industry to be ever profitable and ready for every challenge which the industry faces time and again. To get more details about Swash's technological platform, development and models, click here. KENMerchant™ enables retailers to convey an E-2-E retail software solution that merges Finance, Marketing, Inventory, e-Commerce, CRM and POS on a single platform. With our advanced retail management system, retailers are empowered to offer substantial and enchanting experience, offer more product, and drive customer satisfaction across various channels. It provides solutions that will perfectly suit the entire range of retail businesses, from companies with one outlet to large chains with multiple stores. Moreover it offers a 360 degree view of retail operations. Although most of the companies have been using RMS for a long time as a result of a need for managing retail information, stock information, point of sale etc., RMS developed without the required properties will not be able to deliver the desired result. Due to the rapid progress in companies like increase in number of the shopping malls, the increase in the expectations of more sophisticated and automated system to be adopted, the existing RMS becomes inadequate to meet these required needs. We have developed KENMerchant™ in such a manner that it would be able to accomplish the forthcoming changes in the needs of retail business. In other words, our retail management system will be a flexible system such that it could be improved according to the future needs of retail business. KENMerchant™ provides complete solutions for various retail businesses. Here are some of the key features of our retail management solution. KENMerchant™ helps businesses making the procurement process easier. Everything is processed electronically, from the look for the correct bidder to the payoff and delivery. Inventory management feature helps you manage inventory in a better way. This can be used to control inventory accuracy, control inventory purchasing and establish decent inventory levels to meet the demands of customers, and to gain the trust and confidence of customers. Retail analysis helps a retailer to target their customers more effectively by campaigns, to increase employee productivity, to enhance response time to market changes and to improve customer service at stores. General accounts feature helps you with better account management. It flawlessly couples core accounting functions for instance accounts payable, accounts receivables, general ledger, bank reconciliation, importing bank statements and more. This feature makes your logistic management simpler. It allows companies to cut the middleman out of the logistics function, saving them money on shipping and allowing them to take full control of their shipping arrangements.